Carnegie Mellon University sent the largest delegation of any university to the World Economic Forum’s Annual Meeting of the New Champions in Dalian, China, Sept. 9-11, 2015. Faculty presenting from the Machine Learning Department were Tom Mitchell, Daniel Neill and Aarti Singh at IdeasLab on the use of machine learning to improve health. Fifteen CMU faculty members, students and staff, including SCS Dean Andrew Moore, participated in presentations and demonstrations throughout the conference. For more information, see the university's WEF webpage, which has been updated with images and blogs related to the Dalian meeting. “Carnegie Mellon is always on the cutting edge of technology innovation, particularly technologies that collaborate with people to address the most pressing challenges of our time, so the World Economic Forum meetings are natural venues in which to share our ideas and demonstrate our technologies,” said Justine Cassell, CMU’s associate vice provost of Technology Strategy and Impact. 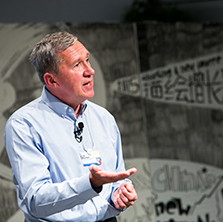 “The Annual Meeting of the New Champions, held in China each year, attracts business, government and civil society leaders who are looking for exactly these sorts of discoveries that will speed the rate of technological progress, while ensuring economic prosperity for all,” added Cassell, who is a member of the WEF’s Global Agenda Council on Artificial Intelligence and Robotics, the Global Agenda Meta-Council on the Future of Health, and the Steering Committee for the WEF New Visions for Education project. More than 1,500 global leaders in business, government, civil society, academia and media attended this year’s meeting in Dalian, often called “Summer Davos” in reference to the WEF’s influential winter conference in Davos, Switzerland. Fifteen CMU faculty members, students and staff participated in a number of presentations and demonstrations throughout the conference.